Made of 100% genuine leather, our 7oz training gloves have reinforced padding and stiching for increased comfort and durabbility, as well as an adjustable wrap-around wrist wrap for additional support. The openpalm design helps to maximize your ground game. 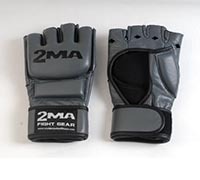 A mixed martial arts division of World Standard Fitness, 2MA fight gear accessories have been designed with the same focus on quality and detail that has made WSF the internationally respected and user preferred brand that it is today.